Sergio Fernández, Diego Berrueta, Miguel García Rodríguez, and Jose E. Labra. 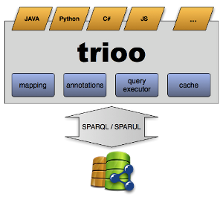 TRIOO, Keeping the Semantics of Data Safe and Sound into Object-Oriented Software. In Proceedings of the 5th International Conference on Software and Data Technologies (ICSOFT 2010), Athens, Greece, July 22-24, 2010.
with Sergio's Master Degree dissertation (in Spanish). The trioo project aims to develop a technology able to easily manage RDF data directly from object-oriented programming languages, allowing the usage of that data without negative influences in object-oriented designs and trying to keep the semantics of data as accurate as possible. The objective is not only to persist that data on RDF stores, but also to consume data available on the Web and to expose the business model of applications as Linked Data. Many moderm programming languajes start to offer new generic mechanisms closer to the object-orientation that to the query technology, but they still fail to offer more natural ways to access the data, from a pure object-oriented perspective. The software industry already offers some solutions since some years ago for relational databases. But it is clear that there is not any satisfactory solution to work with RDF. Because many of the current alternatives are strongly rely on inherited design patterns too close to the entity-relational model. And the RDF model has many special features and semantics that should be treated as such. Therefore, form our point of view, provide a technology capable for managing RDF data in a object-oriented way is a appealing challenge. But this is not just theoretical research. We started this project because in our daily work with Semantic Web technologies we detected a not covered need. Therefore trioo is a project for developers, by developers ; we're very focus on code, and very focus on simplification of the code required to access Linked Data on the Web. Since the approach followed from a very early phase has been completely language independent, trioo could be potentially applied to any object-oriented programming languaje. Currently we're embroiled on carry trioo on two different programming languajes: jtrioo for Java, , and pryoo for Python . Moreover there are more potential languages to explore, but they are out of the scope for the moment. This page contains information about Sergio Fernández's Master Degree dissertation, at the University of Oviedo. Work supervised by Dr. Jose E. Labra and Diego Berrueta. All text and images on this webpage, unless otherwise specified, are licensed under the Creative Commons Attribution-Share Alike 3.0 License. This does not include trioo's implementations' source code, which are licensed under their particular licenses.